We're getting deep into the Windian Singles Series #3 box set at this point. 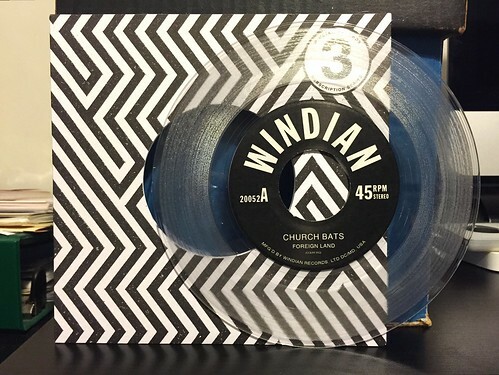 Single number four is by a band called Church Bats. Another new to me band and another fun surprise out of this series. Starting off with the A-side we have "Foreign Land." It's a full throttle, no nonsense rock and roll force. We're talking old school, caveman hitting a log with a stick, repeating guitar chords and howling in a cave vocals. It all works tremendously, giving the song a real intensity and energy that pours through the speakers. Needless to say, I dig this. On the B-Side the band puts forth "Half Man, Half Shellfish." Despite its excellent title, the actual song isn't quite as exciting as you'd hope. It ends up being a pretty straightforward instrumental number. Nothing bad, nothing amazing; it's just there. I think on an album, it would give a nice break hanging out towards the end of the first half. As a standalone song on the 7", it's going to be compared unfairly to the killer A side. All in all, another fun 7" out of Windian and I've got two more to go. I'm going to try to get the next one done for tomorrow, but I may not be able to until Monday. Regardless, you'll see it soon.